When I received ‘The Court of Owls,’ I was initially sceptic of the book: superheroes like Batman, Superman and the like rarely ever work for me outside what I consider to be their ‘natural’ habitat – that of the comic book panel. Sure, there’s been some artistic discipline in the form of other media channels to make me feel like Batman (Batman: Arkham Knight game series on PC, PlayStation and Xbox for example) and of course there’s the tremendous film catalogue to choose from (Christopher Nolan’s trilogy will forever be cemented as the best attempt of creating the Dark Knight on screen in my opinion, but I still love Michael Keaton as the eponymous superhero, sorry Affleck!) But what with an oversaturated market of brightly costumed heroes these days (Avengers 56: Endgame Infinity Electric Boogaloo) novels that incorporate comic books into their plotlines can be something of a mixed bag. At their best, they can transport readers into a fantasy world where their imagination plays out like a storyboard panel, and diehard fans will relish a new perspective of their favourite character in prose format. When they’re less successful, however, they come off as jarring, like eating a sweet that turns out to be turd flavoured, leaving a bad taste in the mouth. Therefore, I was surprised to find that Titan’s The Court of Owls does a tremendous job of giving the reader a layered and disturbing mystery to solve that is worthy of gracing the pages of any crime novel. It’s not often that the ‘detective’ element of Batman’s character arc is utilised in such a fashion, but Cox offers the reader something that has rarely been seen on page within Batman’s universe – a multi-narrated crime thriller with characters worth investing in. If you’re not up to date with Batman’s rogue gallery, then it may be worth your while to invest some time with Scott Snyder’s graphic novel, The Court of Owls Saga. The plot line revolves around the titular court of owls, a secretive and insidious group of people who have been running Gotham from the shadows for centuries and have a long history with the Wayne family. The Court of Owls was first thought to be an urban myth, a playground nursery rhyme devised to scare young children, but they start to emerge from the shadows when Bruce Wayne reveals plans to build upon the city of Gotham and expand the city into something more akin to Metropolis, with soaring skyscrapers and jobs for people living in the slums. In the graphic novel, the theme of Gotham being synonymous with Batman is dissected and eviscerated, introducing a new deadly adversary that gives Batman a run for his money as well as being fresh and original (the ‘owl’ type costume may have been inspired by Night Owl’s look from Alan Moore’s Watchmen, but with the Owl being a natural predator of Bats, it works.) The heavy work of The Court (i.e. murdering) is carried out by enforcers known as the Talons. Talons are highly-skilled assassins who have both enhanced healing abilities (think Wolverine) and heightened dexterity and strength, making them tough SOB’s indeed. There’s a real sense of danger when a Talon is on a panel, matching Batman in both skill and combat. Snyder gets Batman, plain and simple. He’s got the brooding, stoic voice of the Dark Knight down to a tee and leaves each episode on a cliff-hanger. Greg Capullo’s art is also incredible, seamlessly splashing action sequences and the vulnerability of Batman as he tries to escape from the labyrinth of the Owls. But we’re not here to talk about the graphic novel, we’re here to review the prose. Cox’s narrative starts after the events of The Court of Owls Saga, with the death of a University professor – bringing into the spotlight a forgotten mystery involving the Court of Owls. The narrative unfolds through two timelines, and I found this one of the greatest strengths of the novel. In present-day Gotham, Batman dons his detective cowl, searching for a missing university student whilst battling a formidable Talon. The descriptions of Gotham are sublime and you get the sense that you’re trespassing in a dilapidated city with smoke billowing from manhole covers, rain pelting down and sinister alleyways just around the corner. You can almost smell the detail in the text. The present scenes are littered with fight segments and are written with aplomb by Cox. Any previous reservations about comic book superheroes translating to prose were shuttered away as the pacing Cox puts the reader through makes the book an instant page turner. You really get the sense you’re in the action. In the past, we follow the tragic life of Percy Wright, an artist and scientist given the unenviable task of creating an elixir-like McGuffin that, in the hands of the Court of Owls, would grant them unimaginable power. I thoroughly enjoyed the ‘past’ timeline with Percy, his ice-queen wife and his muse. One the negative side of things, Cox doesn’t really flesh out the character of Batman that much and there’s a few questionable segments of his dialogue that made me think there was a target demographic for this particular iteration of the caped crusader. There’s one passage where Batman ‘clocks’ a tower, and this word just didn’t sit well with me. There’s a couple of these instances and Batman doesn’t seem broody enough in this novel, more like an all-stars Batman, but that was a minor quibble on my part. Even though we’re dealing with superheroes, unstoppable villains and the like, the last act seemed a tad out of touch with a ‘fiery’ end-level type boss to contend with. There’s inclusion of other characters (Night-Wing and Batgirl) but these parts feel a little tacked on, as if there was a contractual obligation to have a few of Batman’s comrades in the narrative. Overall however, Cox weaves a fine entry in the Batman mythos, with atmospheric settings and a genuinely dark storyline. It would be hard to sell this to a non-superhero/Batman fan, but for those who love Gotham’s favourite vigilante, you’ll be hard pressed to find another book that stacks action, mystery and thrills all in equal measure. The Court of Owls is published by Titan Books and is available here. Greg Cox is a New York Times bestselling author known for novels tying into some of the most successful franchises in media today, including Star Trek, Planet of the Apes, Terminator, and Godzilla. He’s contributed some of the most popular prose novels involving the DC Universe, from the sweeping mega-series 52, Countdown, and Final Crisis to the blockbuster movie tie-ins Batman: The Dark Knight Rises and Man of Steel. This is the tale of a town on the fringes of fear, of ordinary people and everyday objects transformed by terror and madness, a microcosm of the world where nothing is ever quite what it seems. This is a world where the unreal is real, where the familiar and friendly lure and deceive. On the outskirts of civilisation sits this solitary town. Home to the unhinged. Oblivion to outsiders. Shallow Creek contains twenty-one original horror stories by a chilling cast of contemporary writers, including stories by Sarah Lotz, Richard Thomas, Adrian J Walker, and Aliya Whitely. 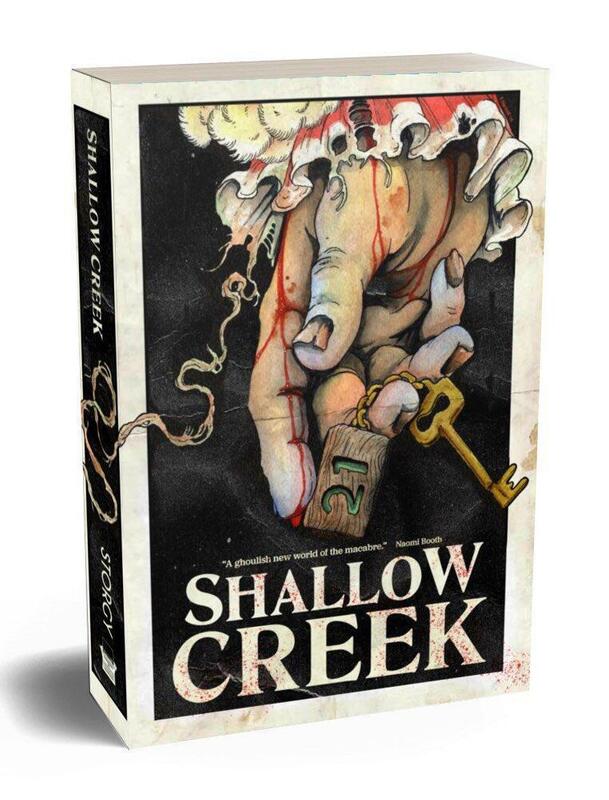 Told through a series of interconnected narratives, Shallow Creek is an epic anthology that exposes the raw human emotion and heart-pounding thrills at the the genre’s core. You can also purchase a copy of EXIT EARTH below! Posted in book reviews and tagged A Batman Novel, Batman, Batman The Court of Owls, Book, Book Blog, book bloggers, book list, book review, book reviews, books, Bookworm, Comic Books, comics, DC Comics, Fiction, Fiction Review, fiction reviewed, Fiction Reviews, Graphic Novels, Greg Cox, literary magazine, Literature, Literature Lover, Literature Review, LiteratureLover, superhero, The Court of Owls, Titan Books. Bookmark the permalink.